What is the Khilafah (Caliphate)? The Khilafah (Caliphate) is a general leadership over all Muslims in the world. Its responsibility is to implement the laws of the Islam system and convey the Islamic Message to the rest of the world. The Khilafah is also called the Imama as both words have been narrated in many sahih ahadith with the same meaning. The Khilafah ruling system bears no resemblance to any of the governments in the Muslim world today. Although many commentators and historians have tried to interpret the Khilafah within existing political frameworks, it is in fact a unique political system. 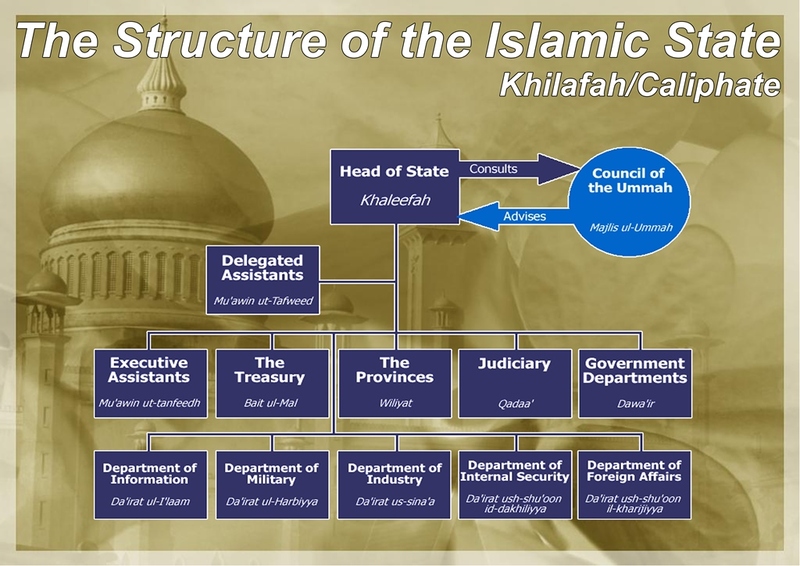 The Khaleefah (Caliph) is the head of state in the Khilafah. He is not a king or dictator but an elected leader whose authority to rule must be given willingly by the Muslims through a special ruling contact called baya. Without this baya he cannot be the head of state. This is completely opposite to a king or dictator who imposes his authority through coercion and force. The tyrant kings and dictators in the Muslim world are ample examples of this, imprisoning and torturing the Muslims and stealing their wealth and resources. This contract of baya stipulates that the Khaleefah must be just and rule the people by sharia. He is not sovereign and cannot legislate laws from his own mind that suit his personal and family interests. Any legislation he wishes to pass must be derived from the Islamic legal sources through a precise and detailed methodology called ijtihad. If the Khaleefah legislates any law contrary to this or commits oppression against his people, the highest and most powerful court in the State – the Unjust Acts Court (mahkamat mazalim) can impeach the Khaleefah and order his removal from office. The Khaleefah has been likened by some to a Pope, who is the Spiritual Head of all Muslims, infallible and appointed by God. This is not the case as the Khaleefah is not a priest. His post is an executive post within the Islamic government. He is not infallible and can make mistakes, which is why many checks and balances exist within the Islamic system to ensure he and his government remain accountable. The Khaleefah is not appointed by Allah rather he is elected by the Muslims and assumes authority through the contract of baya. The Khilafah is not a theocracy. Its legislation is not restricted to religious and moral codes that neglect the problems of society. Shari’ah is a comprehensive system that legislates on political, social, economic, foreign policy and judicial matters. Economic progress, elimination of poverty and enhancing the people’s standard of living are all goals the Khilafah will aim to achieve. This is completely opposite to the backward, medieval theocracies founded in Europe during the middle ages where the poor were forced to work and live in squalid conditions in return for the promise of heaven. Historically the Khilafah was an immensely wealthy state with a flourishing economy, high standard of living and a world leader in industry and scientific research for centuries. The Khilafah is not an empire that favours some lands above others. Nationalism and racism have no place in Islam and are totally prohibited. The Khaleefah can be from any race or colour, and from any school of thought (mazahib) as long as he is Muslim. The Khilafah is an expansionist state but does not conquer new lands in order to steal their wealth and resources. Rather its foreign policy is to convey the Islamic message alone. The Khilafah bears no resemblance to the republican system that is widespread in the Muslim world today. The republican system is based on democracy where sovereignty is given to the people. This means they have the right to legislate laws and a constitution. Sovereignty in Islam is to the sharia. No one in the Khilafah including the Khaleefah can legislate laws from their own minds. The Khilafah is not a totalitarian state. It cannot spy on its Muslim or non-Muslim citizens. Everyone in the Khilafah has the right to express his or her opposition to policies of the state without fear of arrest or imprisonment. Torture and imprisonment without trial is completely forbidden. Establishing the Khilafah and appointing a Khaleefah is obligatory on all Muslims in the world, male and female. Performing this duty (fard) is the same as performing any other duty which Allah has ordered us, where no complacency is allowed. Indeed the Khilafah is a vital issue for the Muslims. The future Khilafah will undoubtedly usher in a new era of peace, stability and prosperity for the Muslim world and beyond, ending years of oppression by some of the worst tyrants this world has ever seen. The days of colonialism and exploitation of the Muslim world will finally come to an end, and the Khilafah will utilise all resources at its disposal to further the interests of Islam and Muslims as well as establish an alternative for the people of the world to the Capitalist system.